The top tin carry black loose/leaf tea with natural cornflower, marigold, safflower, mango, pineapple and bergamot & cinnamon flavour - 50g. The bottom tin carry black loose/leaf tea from the Gampola region -75g, no additives. Nothing can enrich your day more perfectly than the taste of Captain's Tea with its subtle essences of bergamot and pure black tea. Together, they release a calming aroma and smooth taste that is relaxing and stimulating. 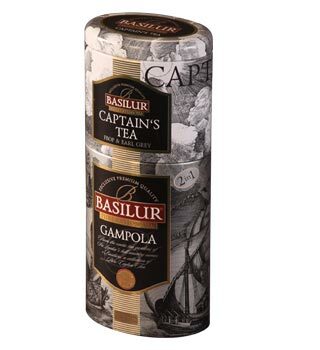 Basilur Gampola tea is made from the dark rich loose tea which is found on the island's fertile lands of the famous 'Kandy' tea plantations. This is your answer to a smooth full bodied and warming cup of Ceylon's purest tea.